Grave/Memorial Reference: 1. F. 18. 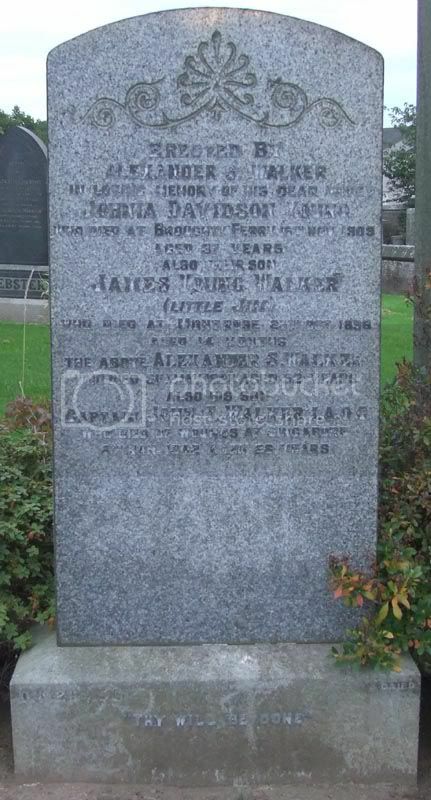 Broughty Ferry reader BOB PATERSON writes "When wandering through BARNHILL CEMETERY recently I noticed a headstone - showing that a GEORGE TULLIS had fallen at the Battle of The Somme in September 1916 and had been buried at ALBERT in the department of the SOMME in France . " Bob, who is a Somme historian and chairman of the Western Front Association Tayside , comments "These inscriptions were popular at the time as the fallen were never brought home and were buried on the battlefields. "I go to the Somme quite a lot so a few weeks ago whilst visiting the area. I took the opportunity of finding the grave of GEORGE . "GEORGE (28) was a member of the 42nd battalion Canadian Infantry and is actualy buried not at Albert but at COURCELETTE , a small village where fierce fighting took place , about six miles away from Albert. George probably emigrated to Canada but here he was fighting for the cause ." "ONE OF THE BRAVE "